I used a few pieces of cod fillet, sliced into chunky pieces, but as MarkE says, “A big bit of cheap, not particularly tasty fish fillet/loin – cod and haddock is fine, pollock will do too, anything really”, so feel free to mix it up a little. If you wanted even more protein, you could also throw some beans in there, something like cannellini beans. That would be good. 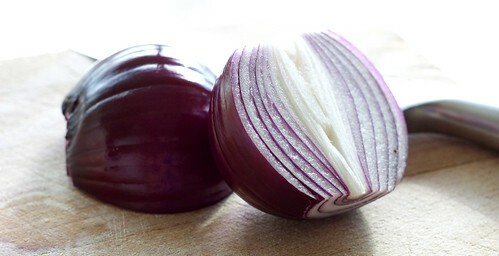 I also used one large red onion, because I love the flavour and colour of red onions. I think they’re much sweeter than regular onions and just all round delicious. MarkE says to use one medium potato and chop it into cubes, I used two small-medium potatoes, peeled them and then chopped ’em up. I probably could’ve cut them a little smaller, but I was being lazy. I also added about 2 cups of water to the chopped tomatoes because it was a little too thick for my taste, otherwise. You could use stock for even more flavour, if you like. 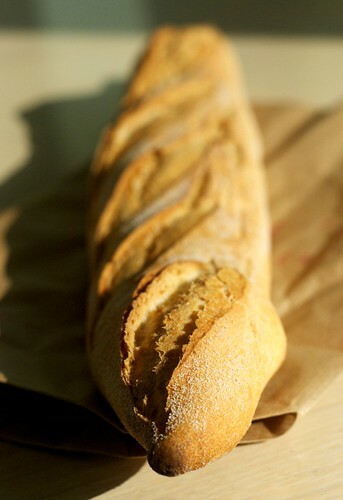 I served it all alongside this beautiful crusty Artisan Baguette from Gail’s Bread, which opened up recently on Chiswick High Road. In all seriousness, this bread is ridiculously crunchy and crusty, so much so that yesterday evening whilst I was serving up for myself and Momma Lee, I actually threw my back out slicing the bread. I kid you not. It had already been niggling me for a couple of days but I guess the pressure I was exerting and the way I was twisting my back to really get in there was the final straw. I then spent the next ten minutes lying on the floor, tears streaming down my face, unable to move. It finally eased up a little, enough for me to eat some dinner, and the rest of the evening found me lying on the floor, alternating between a hot water bottle shoved into my back and, for lack of a suitable cold compress (we have no ice or peas in the house)… a frozen joint of ham. Yeah. Seriously. Sorry, I’m totally deviating from the original post here, but I just had to share. Eventually something in my back popped and I could move again, but I’m going to see a physio later this morning to work it out, just in case. So yeah, crusty bread. Dangerous for backs. 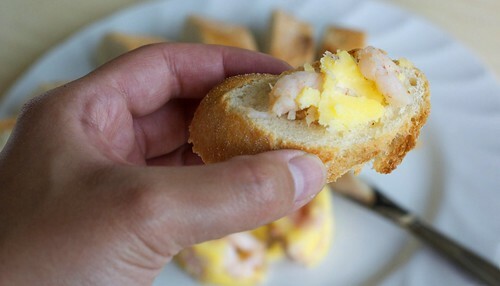 I also served the fish stew and bread alongside some lovely potted shrimp from Marks & Spencer’s – mhm, it was goood. M&S do some awesome food, it’s a little more on the pricey side but that’s because they use high-quality ingredients and they are uber tasty to boot. Anyway, you should try this fish stew recipe. It is packed full of flavour and is definitely not dangerous (like the bread). I’m actually pretty much going to republish the recipe as I received it, because it really made me laugh. The only real change I’ve made is that I threw the tomato puree, herbs and spices in after frying the onion for a bit, then the chopped tomatoes – when using spices, particularly when you’re making a curry, the earlier you add your spices the more intense the flavour. So I would recommend doing it this way, rather than the way MarkE suggests. Anyway, thanks for the recipe MarkE! A big bit of cheap, not particularly tasty fish fillet/loin – cod and haddock is fine, pollock will do too, anything really. A large dish for cooking stews in that can sit on the hob. 1. Chop onion(s) into small bits – cubes are always popular. 2. Heat oil on lowest heat for 30 secs. Throw in onion, cover. Uncover and stir occasionally if you like. Leave for 12 mins or until your onion is soft and translucent. 3. 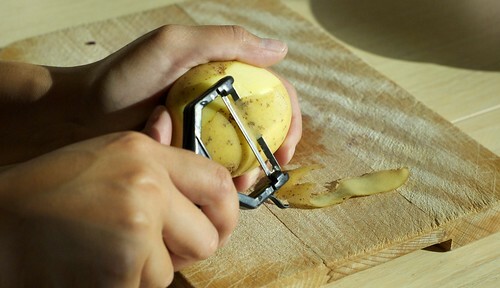 Meanwhile: chop up potato into tiniest pieces possible. 2mm cubes would be great. 4. If you bought tinned tomatoes instead of tinned chopped tomatoes, now is the time to chop them. There are machines that make this easy. 5. 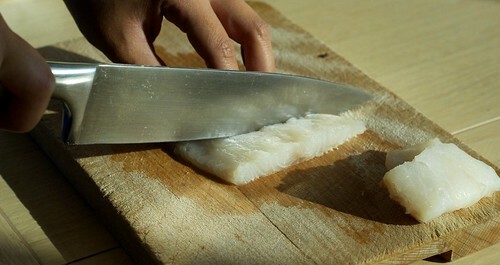 Chop up your fish into nice big tasty morsels. Small teeny morsels will disappoint. 6. After your onions are cooked, throw in the chopped tomatoes and tomato puree if you’re using it. Turn heat up a bit to around medium. Stir. Heat for a minute. 7. Throw in all spices and herbs you’ve selected. Stir. (Like I mentioned, swop steps 6 & 7 for more intense flavour, but include the tomato puree with the spices and herbs). 8. Nonchalantly drop in the tiny potato bits, stir, cover, leave for 5-10 minutes. 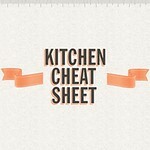 (If using the two cups of water/stock to thin out the stew, add this now, a cup at a time, and give it a good stir. If it looks too thin you can turn the heat up a little to allow it to thicken – keep an eye on it and make a judgement call). 9. Carefully lower in the fish, cook for approx 5 minutes or until it’s cooked/opaque/stopped screaming. Season to taste with salt. (Hint: when cooking stews or soups never add salt until the end, because otherwise the liquid will reduce right down and you’ll be left with super condensed salty food). 10. Serve with good, crusty bread. (Try not to throw your back out when you’re carving it. Devour. Preferably sitting down, but if you have to lie on the floor because you’ve thrown your back out, so be it). Thanks again MarkE, and if you want to get involved in the food challenge you know what to do! Until next time, peace and love. What a great post. Whole Foods makes a similar fish stew that always tempts me when I walk by. I'm really excited to give this a try. I'm sorry about the bread and your back…at least it tastes good! I hope you have a beautiful day. Thanks Monet =) I went to the physio this morning and feeling much better now! Have another appointment next week and some exercises to do in the meantime! 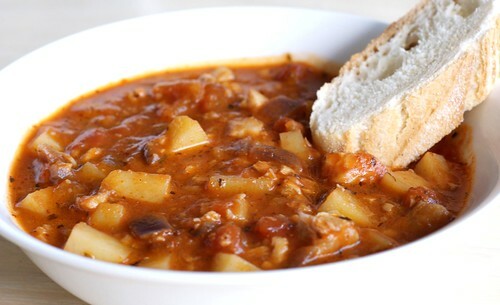 Please do try this stew – it is pretty darn tasty. I think it'd be better in the winter, but it's a pretty good cool summer evening dish. That looks great. I have never had this type of stew before. It looks refreshing. Thanks for swinging by, Joy! Fish stew is much lighter than other meat stews, and because of the spice it really kicks it up a notch. If the consistency of the sauce were a little more soup-y and I threw together a little rouille this could pass for a very decent fish soup, too. 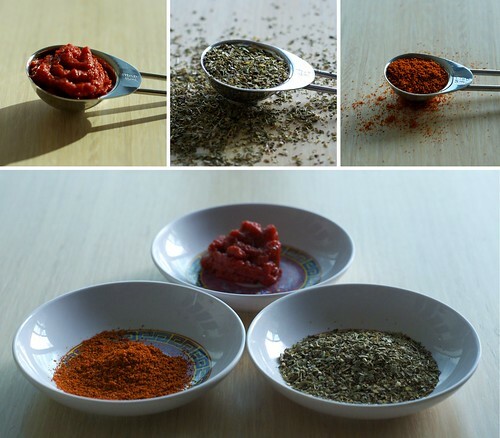 Jax, I luv your pix of the spice montage – brilliant…great post. You make a sassy saucy stew, for sure.